Since our own vineyard was just planted this year. we had to once again purchase our grapes. We made the drive to Honey Flow Farm, located in Dryden, MI. 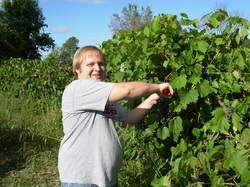 It is a you pick vineyard with good selection and pretty high quality grapes. The only bad thing is that timing is everything if your not there first thing, others will have to rows picked clean. Prices are okay and the good thing is that you pick the grapes so you can take your time and be choosy about the grapes you select and pick out poor quality fruit so that you only pay for the fruit you want. This year my mother in law came with me to pick. 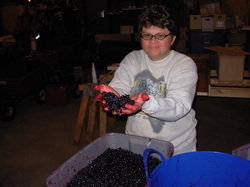 Lori is almost always helping out in our wine making, I personally think it is because she knows we pay in samples of our wine! This year we picked Frontenac for a dry red, St. Pepin for a dry and sweet white, and out of wives assorted family members backyard vineyards we picked some concord. 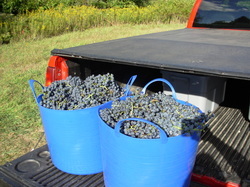 2 bushels of Frontenac picked and awaiting to be weighed and payed for. After we arrived home with the grapes we worked into to cool evening and picked through each cluster removing unripe grapes and other foreign matter. 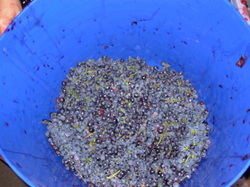 Most winemakers skip this part unless clusters are very poor. I figured that I work with such small batched why not use ultra clean/premium grapes. 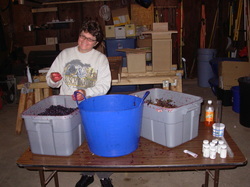 At the same time we clean the fruit we also remove the grapes from the stems. This whole process goes relatively quick. 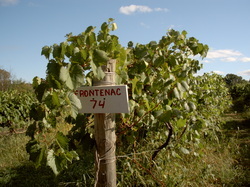 The 2 bushels of Frontenac took only about 45 for the two of us to go through. 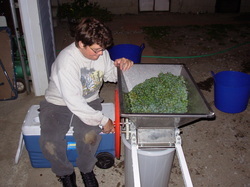 After we clean the grapes, we then transfer them to the crusher. 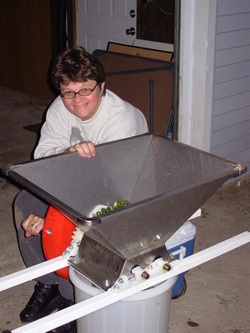 My crusher is all Stainless steel ans uses rubber roller to gently crush the grapes. 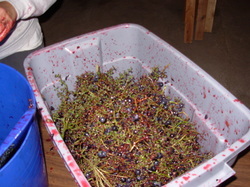 After crushing the grapes are places in a primary fermentor where other chemicals are added. and sugar is checked and adjusted if needed. No adjustment for sugar was needed this year. the growing season proved to be good. Here crushed Campden tablets are added to kill wild yeasts and protect against oxidation. I found it easier to use a drill powered padle to mix things in. Must is now ready to sit over night. Then pectic enzyme is added and 24 hours later yeast will be addded then we wait. 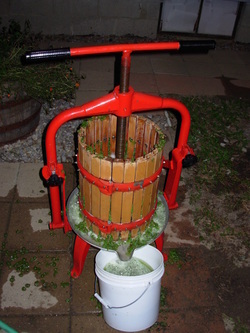 For the St. Pepin, after the grapes where crushed they where then pressed out to extract all the juices. The red will sit and fermant on their skins for a few days before they are then pressed. Another view of our press in action. Up to this point here is a listing of what has been done to each variety. 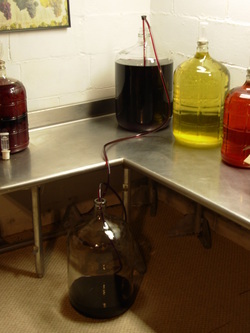 -Placed in primary fermentor and Campden tablets added to kill wild yeasts and prevent oxidation. 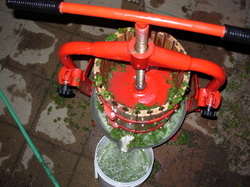 -Used grape press to press juice. -Checked sugar levels, adjusted if needed. Normally I would rack the wines off the sediments and make fine tune adjustments for acid and SO2 levels about 3-4 weeks after fermentation had stopped. 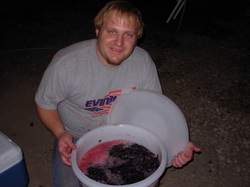 Because a of a death in our family I was not in the mood or had the time to touch the wine for almost 2 months. The good news is that I think it added more character to the wine having sat on the lees and also it allowed the wine to clarify thus eliminating the need for a second racking before bottling. 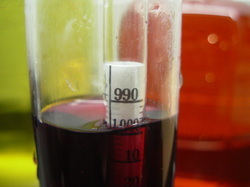 Below are some pictures of the racking process and a check of the S.G. of the wine. Racking of the Frontenac and preliminary tasting notes. Here is an overview of my current wine area. The Frontenac has just started to be racked. 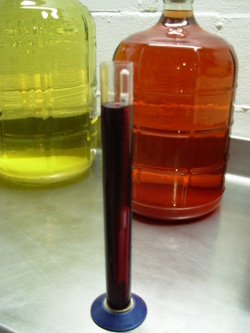 Here you can see that we had excellent color extraction and the light pinks on the edge show us that it has not been hit by oxidation and is a younger wine. 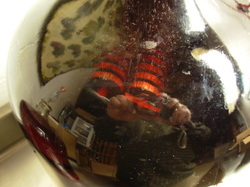 Here you can see the spirals submerged in the wine. A closer look at the process. 3 Campden tablets where also added to the wine to help prevent oxidation. SO2 levels where checked before this was done though. S.G. Reads right at 1.000, don't be fooled thats its .998 remeber liquids have retension! I decided to oak the wine to impart a more complex mouth feel and taste. These are the spirals that are made be the Barrel Mill. I went with a medium toast. Nose is underdeveloped and still very young and somewhat yeasty. Mouth feel is lighter with a heavy fruitiness upfront, the finish is very peppery and dry. I think the wine would benefit from oak (which I am doing) and longer aging. There may need to be some fine tuning with the acid in the wine as well. I will check the wine in about 4 weeks to see the status of the progress.....although I may have to sample a little before. The last step is to bottle the wine. I consider myself lucky because I normally have help for this step. It could be done my one person, but I would not recommend it. It is a lot of work, and very hard to do single handed! Here is how I break down the work. 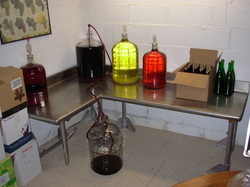 I normally handle the racking of the wine to a suitable container to fill from, I also add all chemicals and stir them in, I also fill bottles, place shrink caps on bottle tops, print and attach labels, and oversee all operations. Lori washes everything!!!! And I mean everything bottles, equipment, all to sanitary perfection. She also adds sugar if needed and hands me bottles as I fill. Roy corked all bottles and wiped them down after to remove any spilled wine from the outside of the filled bottles. Below are the steps involved. As Lori cleaned and sanitized bottles she places them on the drying tree. Here the Concord Rose' wine has just had sugar and Potassium Sorbate added, and is waiting to be bottled. 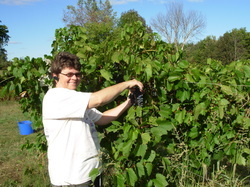 Here Lori hands me a clean bottle from the tree to be filled. This is one thing I need to upgrade! 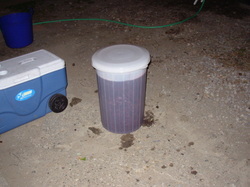 I use a gravity filler and it is slow...and I have to be lower than the wine I am bottleing so this means the floor. Everything is cleaned and I lay a towel down to take care of spills but my knees hurt like no other after about 2 cases. Waiting and waiting and.......... I will upgrade for next year! Straight from Italy a real Ferrari! It really is a Ferrari stand corker. If you do a lot of wine buy one of these it is really worth it. They are fast, easy to clean, and really well made. 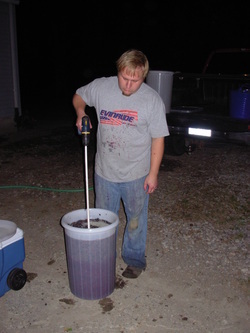 Here Roy uses the floor corker to insert sanitized and then dried corks into the bottle. 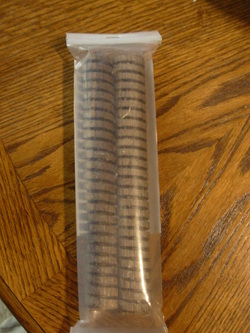 The last step is applying the labels. All done. This bottle is off to the cellar. Here are the 3 wines we bottled during this day. Don't they look nice. On April 5th, 2011 we finally bottled our 2010 vintage Frontenac. I forgot to take pictures while we where bottling, however the process was pretty much the same as bottling the St. Pepin and Concord. The only difference being that just before bottling I did not add anything. 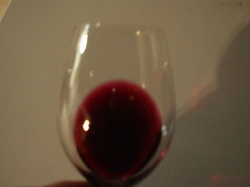 The wine is a true Vintage style red. I am curious to see how it will age. Tasting during bottling. Subtle oak with hints of smoke, A very light nose still noticeably young. Very much a fruit forward wine upon first taste with a noticeable higher acid content. Ended up with 27 bottles of Frontenac.